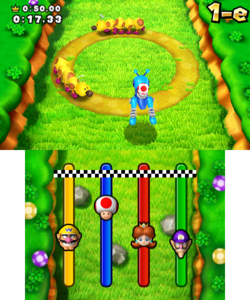 Quickest Cricket (known as Grasshopalong in PAL regions) is a General minigame from Mario Party: Island Tour. The European/Australian name is a portmanteau of "grasshopper" and "hop along." The players hop around three times on their crickets. The players must race each other to the finish line mounting mechanical crickets, whilst avoiding rocks, Piranha Plants, and Wigglers. Rules – NTSC "Race to the finish atop a mechanical cricket." Rules – PAL "Navigate your mechanical grasshopper through the course to reach the finish line." This page was last edited on April 6, 2018, at 21:06.